Sabjorn is a Nord citizen who lives in and owns Honningbrew Meadery, a newly established competitor to the Black-Briar Meadery in Riften. Sabjorn had the courage to turn down an offer from Maven Black-Briar, and as a result, you will have to cause Sabjorn's downfall during the Thieves Guild quest Dampened Spirits. Before the quest, Sabjorn runs his Honningbrew Meadery peacefully, with the aid of his assistants, Mallus Maccius and Eimar. He will stand behind the counter offering assorted foodstuffs and his special Honningbrew Mead from when he wakes up at 6am until he retires to his private quarters at midnight. 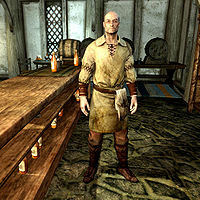 Sabjorn wears a set of barkeeper clothes and a pair of shoes. He carries a steel dagger and nothing else. When you approach him, he will appear serviceable and kind: "Welcome. I'm the owner and proprietor of Honningbrew Meadery." and "Honningbrew uses only the finest natural honey, not that sludge you'll find at Goldenglow Estate." He will also say: "We may be small, but what we lack in size we make up for in quality." Lastly, he will take the opportunity to badmouth his competition in Riften: "Black-Briar Mead is just fine, if you need something to wash the dirt off a riding horse's hooves." 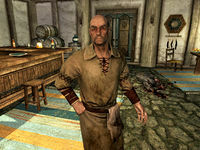 However, while Sabjorn puts on the cheerful act, his assistant Mallus Maccius is overly bitter about everything, saying: "If you want to buy something, go find Sabjorn. Otherwise, piss off. ", "To tell you the truth, Sabjorn isn't much of an owner. Slave driver, sure." and "I've never met someone like him that revels so much in other's [sic] misery." 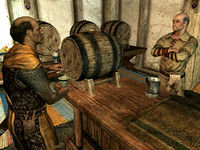 The other worker at the meadery, Eimar, sees little wrong with his employer and will comment: "If you're looking to purchase any mead, speak to the owner, Sabjorn." and "We're a small meadery, but growing quickly. Sabjorn's only been running this place for a short time now and look at it." After your discoveries at Goldenglow Estate it becomes apparent that someone is out to get the Thieves Guild, and Brynjolf is understandably puzzled about the odd contract you brought back from Aringoth's safe. Nevertheless, he also points you towards Maven Black-Briar who has a job for you, as the competition from Honningbrew Meadery poses a threat to her sales of Black-Briar Mead. This marks the beginning of the end for Sabjorn and starts the quest Dampened Spirits. When you meet Maven inside the Bee and Barb she will explain what needs to be done: "I have a competitor called Honningbrew Meadery that I want to put out of business. I also want to know how they managed to get the place up and running so quickly." She will then tell you about unhappy brewmaster Mallus Maccius, and that you are to meet him in Whiterun. When asked who runs the show in Honningbrew Meadery, she will say: "Some layabout named Sabjorn. Been a thorn in my side for the last few years now." She will also explain that Sabjorn is more than just healthy competition: "Not a day goes by that I don't regret letting Sabjorn get as far as he did. In only a few short years, he's taken that bile he calls mead to market and a chunk of my profits with it! I can't imagine where he found the gold to take it to market so quickly." She will then explain how Sabjorn's downfall will benefit her: "With Sabjorn in prison, his meadery will be forced to close. Then I swoop in and take over the place. No more competition." Lastly, she will inform you why it is wise to strike now: "The Goldenglow Estate job has undoubtedly interrupted the supply of honey I need to make my mead. Sabjorn could use this interruption to his advantage and collect a larger share of the market. I can't have that." Mallus plots to get rid of his employer. In the Bannered Mare in Whiterun, you will find Mallus Maccius who will explain his scheme: "I'm going to keep this short 'cause we've got a lot to do. Honningbrew's owner, Sabjorn, is about to hold a tasting for Whiterun's Captain of the Guard and we're going to poison the mead." When you ask him if he has the poison, he will say: "No, no. That's the beauty of the whole plan. We're going to get Sabjorn to give it to us. The meadery has quite a pest problem and the whole city knows about it. Pest poison and mead don't mix well, you know what I mean?" He will then explain where you fit in: "You're going to happen by and lend poor old Sabjorn a helping hand. He's going to give you the poison to use on the pests, but you're also going to dump it into the brewing vat." When you commend him on the clever plan, he will say: "Maven and I spent weeks planning this. All we need is someone like you to get in there and get it done. Now get going before Sabjorn grows a brain and hires someone else to do the dirty work." He will then elaborate: "Once Sabjorn is out of the way, Maven has plans for this place. One way or another, we don't want the pests coming back. Consider it just more of the dirty work. I did my part getting them in there, now you need to clear them out." He will also tell you why he is doing this: "I made the mistake of borrowing coin from Sabjorn. He's allowing me to pay it back, but he's working my fingers to the bone! He treats me like a slave... I have to do every nasty, dirty job in the meadery." He will then tell you about his own reward: "If this plan works, not only is my debt gone, but I'll be set up for life. Maven and I worked out a little deal. If Sabjorn ends up in jail, she's going to take over his meadery. And guess who gets to run the Black-Briar Meadery in Whiterun? You're looking at him." He will bid you farewell with a reminder: "Remember, Sabjorn will be needing a helping hand. Make it look good." "What are you gawking at?" "That's the only way I operate." (Persuade) Passed: "Oh, very well. Here's half. You get the rest when the job's done." Failed: "Well that's not how I operate, so forget it." "You'd better, or I yell 'skeever.'" (Intimidate) Passed: "Okay, okay. No need to make rash decisions. Here's half. You get the rest when the job's done." Failed: "Yell all you want. It's not going to change my mind." "Just pay me when the job's done." "My only demand is that these vermin are permanently eliminated before my reputation is completely destroyed." If you successfully persuade or intimidate him, he will continue with: "My only demand is that these vermin are permanently eliminated before my reputation is completely destroyed." He will then continue, as if you chose the third option: "I bought some poison. I was going to have my lazy, good-for-nothing assistant Mallus handle it, but he seems to have vanished. If you plant this in the vermin's nest, it should stop them from ever coming back." When you accept the task he will say: "Don't come back until every one of those things are dead." At this point, a few more options will be available. You can tell him you have yet to finish the job, and he will angrily say: "Why are you standing here then? I've told the captain of the guard we'll have the meadery cleared for the tasting and he could be here any minute." He will also unknowingly share how he tricked his assistant: "Mallus is the best deal I've ever made. Lent him a bit of gold some time ago I knew he'd never be able to pay back. Nothing like free labor to make operating costs cheaper." When you exit conversation, he will add: "Now I've got to clean up this mess. ", "Remember, you don't get paid until they're all dead. ", and "Please hurry. The Captain of the Guard isn't patient when it comes to tasting time." When you have poisoned the nest and the vat, return to Sabjorn in the taproom and you will notice the captain of the City Guard (Commander Caius or Sinmir, depending on your progress in the civil war) waiting for the tasting. Mallus Maccius will also be present, eagerly awaiting the downfall of his tyrant employer, saying: "I can't wait to see Sabjorn squirm." When you tell Sabjorn that the job is finished, he will ungratefully say: "Well it's about time! I had to stall the captain until you were finished." He will, however, not hand you the reward before the tasting is over: "You'll just have to wait until after the captain's finished. I suppose you can wait around if you must." 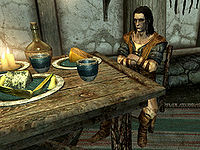 At this point, you can ask him about how he is able to compete with the Black-Briar Meadery: "Maven Black-Briar's gone out of her way to try and have me shut down, but fortunately I have a good relationship with Whiterun's Jarl. Every year, I sell more Honningbrew and Maven loses customers. Know why? My mead tastes better." When you hint that it must have taken a fortune, he will admit: "Well... yes. I mean, all of the gold didn't come from me. I have a silent partner that helped with the finances." He will, however, not put a name on his silent partner: "Silent means I don't tell and it's none of your business." "Oh come now, this is mead... not some wine to be sipped and savored." Captain: "Well, Sabjorn. Now that you've taken care of your little pest problem, how about I get a taste of some of your mead?" Sabjorn: "Help yourself, milord. It's my finest brew yet... I call it Honningbrew Reserve. I think you'll find it quite pleasing to your palate." Captain: "Oh come now, this is mead... not some wine to be sipped and savored." Captain: "By the Eight? !/Shor's Bones! What... what's in this?" Sabjorn: "I... I don't know. What's wrong?" Captain: "You assured me this place was clean! I'll see... see to it that you remain in irons for the rest of your days!" Sabjorn: "No, please! I don't understand..."
Captain: "Silence, idiot! I should have known better... to trust this place after it's been riddled with filth." Sabjorn: "I beg you... please. This is not what it seems!" The sickly captain will then walk over to Mallus and say: "You... you're in charge here until I can sort this all out." While Mallus accepts the responsibility, he will walk over to Sabjorn again: "And you... you're coming with me to Dragonsreach. We'll see how quickly your memory clears in the city's prisons. Now move." Sabjorn will then try to defend himself, saying: "Look, I assure you, this is all just a huge misunderstanding!" The captain will then draw his weapon and shout: "I said move!" While a sad Sabjorn is dragged out of his own taproom, Mallus can't resist to comment: "Farewell, Sabjorn." A confused Sabjorn will then find himself in the dungeon of Dragonsreach, unaware about the huge scheme set up against him. When you tell Mallus that you need to look through Sabjorn's books, he will hand you a key and say: "So, Maven wants to hunt down Sabjorn's private partner, huh? You're welcome to take a look around Sabjorn's office. He keeps most of his papers stashed in his desk." In Sabjorn's private quarters, you will not only find a letter from Maven to Sabjorn, you will also find another clue to the person who wants to put Maven and the Thieves Guild out of business. Back in Riften, Maven Black-Briar makes it clear that she had expected more information about Sabjorn. When you hand her the promissory note, she will comment: "This doesn't tell me much. The only thing that could identify Sabjorn's partner is this odd little symbol." In the Thieves Guild, Brynjolf will comment on your effort: "Word on the street is that poor Sabjorn has found himself in Whiterun's prison. How unfortunate for him." When you tell him about the letter signed with a strange symbol, the same symbol found inside Goldenglow Estate, he will say: "Then this is beyond coincidence. First Aringoth and now Sabjorn. Someone's trying to take us down by driving a wedge between Maven and the Guild." While the plot thickens in the Guild, Sabjorn will spend the rest of his days behind bars in Dragonsreach dungeon. If you approach him, he will hint that he figured out the person behind his downfall: "It was you, wasn't it. I should of [sic] known better. Now look at me." and "You've sent an innocent man to jail. I hope your [sic] proud of yourself." He will also angrily comment: "Maven be damned. One day, she'll get hers. I can promise you that." and "Leave me alone. Haven't you done enough damage already?" 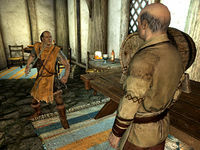 When Sabjorn leaves the meadery with the Guard Captain, he will be disabled from the game. He is re-enabled once you finish Dampened Spirits, this time in Dragonsreach dungeon. In Dragonsreach dungeon, Sabjorn may be found outside his cell. His AI package has too large a radius, allowing him to sandbox all over the dungeon. When making persuasion check, player may leave the conversation right after and restart entire conversation. This offers a chance to repeat the check indefinitely and train Speech. ? This page was last modified on 21 April 2018, at 05:11.